Jane Ehrlich — Kiesendahl + Calhoun Fine Art, Ltd. This particular body of work began to emerge in 1995. These paintings recall to me a nostalgic period from childhood, a glorious, carefree time of summers spent with the protection of family, but with much freedom to roam and explore the outdoors. 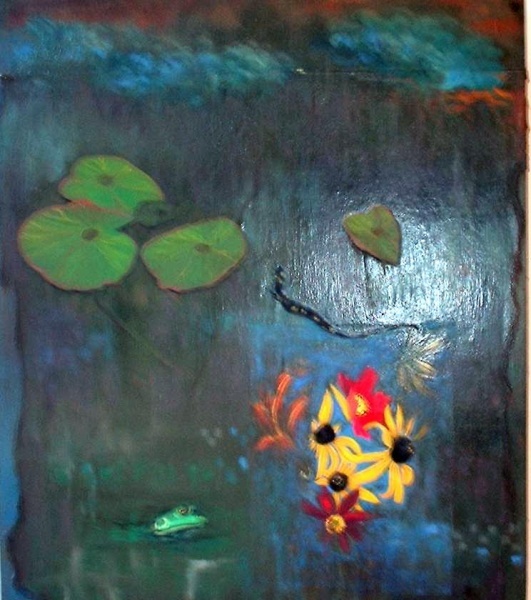 The mystery never quite revealed of lake edges where the lilies grew and frogs floated silently in the jewel like green vegetation that hid them in plain view. The rich black mud would ooze between our toes as we hunted, our cut off milk cartons, filled with pond water, waiting for our prey. Painted with a sometimes naive style, they evoke memories of both fairy tales and specific experiences from my past.